Copywriter | Portfolio | Internal Newsletters . The internal newsletter that I created for All Nippon Airways, "Zenith", had to be educational, informative and fun. We wanted it to be useful, so that staff could actually learn from it, but not be too "worthy" - not be boring, in other words. We also saw the newsletter as a cost-effective way of boosting staff morale and motivation. Over 200 staff at All Nippon Airways' European offices. So What Do The People In Card Centre Do, Anyway? You've all seen them, spoken to them or heard them laughing uproariously. Who are they, those mysterious women with their huge, 29" monitor screens? What is the ANA Mileage Club, exactly? Well, you know when you're shopping at the local Sainsbury's, what do you pull from your wallet along with your credit card? That's right, a loyalty card. Everyone has them and you can accumulate points from each store. Pretty much every major airline operates the same sort of system, except that instead of getting a free shoulder of beef in exchange for points, you can get free flights, upgrades, use of airport business lounges, and goods vouchers. 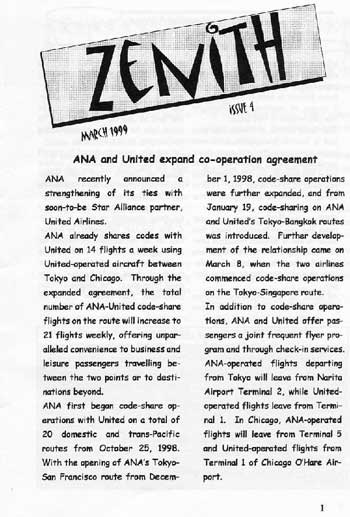 ANA is no exception and operates its own loyalty system, called "ANA Mileage Club (AMC)."